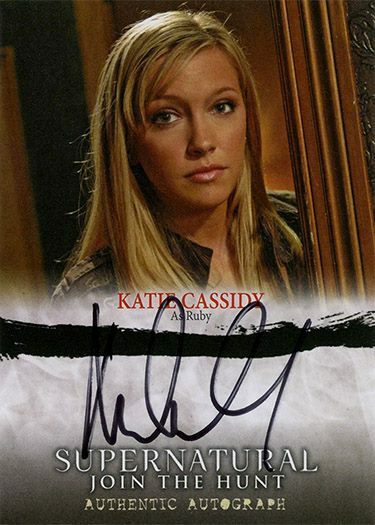 Home » Entertainment » UPDATE – Did Katie Cassidy Use a Rubber Stamp on Her Supernatural Autograph Cards? 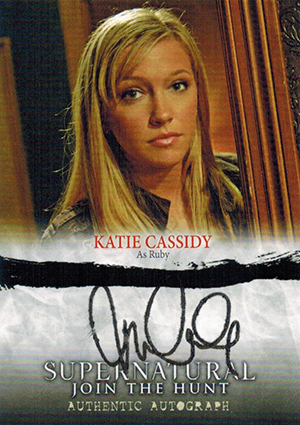 UPDATE – Did Katie Cassidy Use a Rubber Stamp on Her Supernatural Autograph Cards? UPDATE (12/22/14): Cryptozoic has confirmed a lot of suspicions. The 2014 Cryptozoic Supernatural Seasons 1-3 Katie Cassidy autographs inserted in packs were, in fact, done with a rubber stamp. But the card maker is doing what they can to fix the major mistake. They've already got replacements signed and ready to ship out to collectors. Cryptozoic outlines the full exchange details on their website. 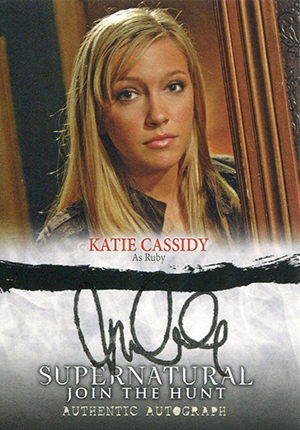 On her recently released Supernatural Seasons 1-3 autograph cards, Katie Cassidy either has the most consistent penmanship ever displayed or the cards might not be exactly as advertised. It looks very possible that the actress, currently seen on Arrow, may have taken a page from the Devante Pelly-Smith autograph playbook and used a stamp or other form of mechanical method to "sign" her cards. What started as a question about running ink on Non-Sport Update's Card Talk message board turned into a different kind of investigation -- whether or not the autographs are real. And the evidence doesn't look good. Other than the thickness of the ink, something common with even basic stamping like the smiley faces found on the top of spelling tests, the signatures on every card shown in the thread look exactly the same. Nothing deviates from the size, letter placement, loops or spacing. Cryptozoic is aware of the situation and they are investigating. They have also removed an image of her signed card from their product page for the upcoming Arrow: Season 1 release. At this point, it hasn't been confirmed as to whether the Katie Cassidy Supernatural autographs are real, stamped or otherwise. However, you should use extreme caution if you're looking at one on the secondary market. Better yet, hold off until things are cleared up. mentioned this to you on twitter, but gonna post here as well. i used photoshop to remove everything but the signatures of the cards you provided. i overlapped them to see how they would line up, and they fit perfect. they are exact. which means, there is no way these are hand signed. this is prolly one of the reason the arrow cards keep getting delayed. such a shame too. dont understand why she would bother signing on to even do cards if she cant take the time to sign them. its dishonest. it’s been a week since Cryptozoic said they would “Investigate” this fake autograph issue (which is sad already since they must have noticed a striking similarity in ALL of her autographs) and not so much as a word on why this occurred. This makes the bad situation seem so much worse imho. I imagine what she did was ‘breach of contract’, right? Isn’t there a contract autograph signers have to sign that verifies the authenticity of their signature on the cards? Ryan � Possibly, but those contracts are private. Since replacements were signed quickly, pursuing things further could jeopardize future deals with others as well if the actors use the same agent or people — even if what happened was wrong and shouldn’t have in the first place.